As I thought about the word change in relation to quilting, I realized that I have been quilting for 30 years as of this year. I began by hand sewing 9-patches in an Amish quilt class and I have never looked back. 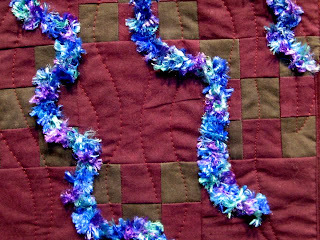 Since I was using solids at the time, I opted to create a background using solid, hand dyed fabrics in a 9-patch pattern. 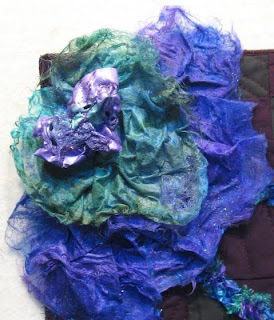 On top of that, I created a flower of sorts using soy silk fiber, painted and melted tyvek and yarn. The flower is a statement about where I am with quilting today. I love embellishing with dimensional materials and playing with new products and techniques. Here is the soy silk fiber with the tyvek piece in the center. I think there is some angelina fiber mixed with the soy silk to add a little sparkle. I crocheted fuzzy yarn and couched it to the background to create these tendrils. 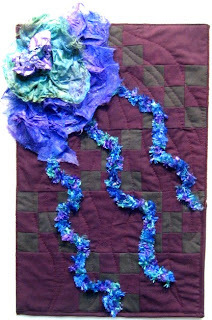 ...after I quilted the background, of course! Thanks for the memories, I've been quilting for 36 years. I preferred the solids back then because they offered more flexiblity...never was very traditional. The flower pops off the background, very dimensional. Keep experimenting and playing. The first thing that I saw was a Jellyfish swimming along in the ocean. Colors were opposite, but that is a "change" too! Karen... this is a wonderful tribute to your quilting years... in a simple, elegant statement. I love the taditional Amish... but the 'modern' flower using 21st century materials. I really do like it. This is very cool. Amish to wild and wooly flower. Wow.